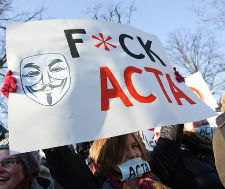 The controversial ACTA treaty is quickly losing support in Europe. After a handful of countries already backed off last week, The Netherlands and Bulgaria put their decisions of hold today. A majority of the Parliament is against the ratification of ACTA. They only intend to change this position if there’s irrefutable evidence that it doesn’t violate basic human rights. And there is more bad news for ACTA supporters. In Bulgaria, where more than 10,000 people took the streets in Sofia last Saturday to protest the treaty, Economy Minister Traicho Traikov announced that the country will not ratify ACTA before other EU countries have made up their minds. “Our country will not undertake any actions, including a ratification of the agreement, until the stance of the other EU member states is made clear,” the Minister said earlier today. The caving support and doubt among governments makes is less likely that ACTA will pass, although it’s still to early to say something conclusive. After Australia, Canada, Japan, South Korea, Morocco, New Zealand, Singapore and the United States signed ACTA last October, Europe is the final hurdle to take before it goes into effect.